Adil Nabi scored for Posh Reserves at Cheltenham. Adil Nabi struck late to earn Peterborough United reserves a draw in their Central League fixture at Cheltenham today (December 13). The midfield playmaker equalised from close range three minutes from time and was only denied a winning goal a minute later by a smart save from the home goalkeeper. Aaron Williams missed a penalty for Posh Reserves at Cheltenham. 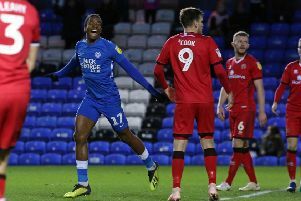 Posh missed a glorious chance to open the scoring in the first-half when Aaron William sent a penalty wide of the goal. Williams also pinged a volley against the post in the opening five minutes. Cheltenham took the lead midway through the second-half with a terrific strike from Joe Hance. Posh boss Grant McCann watched the match at one of his old clubs before heading off to spy on Saturday’s (December 17) opponents Charlton in an FA Cup replay at MK Dons. McCann has been critical of the performances of his fringe players in recent games, but not today. “The attitude was spot on,” McCann stated. “The only disappointing thing was missing a few scoring chances. Williams played as he has been on the substitutes’ bench in recent weeks at Nuneaton where he is currently on loan and needed game time. A change of manager at Nuneaton has worked against the Posh striker. Midfielder Brad Inman, who made his Posh first-team debut on Saturday (December 9) was in the starting line-up. Posh: Tyler, Santos, White, Binnom-Williams, Goode, Nabi, Chettle, Oduwa, Inman, trialist, Williams.